The page size in both the PDF and pre-printed versions is now slightly larger, but the magazine is still set up so that if you print it yourself at 100% size on either A4 or Letter paper all of the content will fit perfectly on the page. This extra space has let me fit more content into less pages, so despite having 14 more puzzles than the previous issue it has 8 less pages (or 4 less in the PDF version). 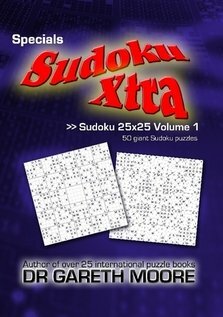 In terms of content, path-finding Ultimazum is back by popular demand, and this issue also introduces Kropki Sudoku, Sudoku XV and my own Integer Multiple Sudoku. Plus there’s a twist on an existing popular type with Non-consecutive Sudoku. Other puzzles include Hanjie, Slitherlink, Yajilin, Heyawake, Nurikabe, Masyu, Hashi and many more. Other Sudoku variants include Samurai Sudoku (both 13- and 5-grid versions), Killer Sudoku Pro, Odd Pair Sudoku, Jigsaw Sudoku, Skyscraper Sudoku, Sudoku 16×16 and tens of other types. Printed copies are on top-quality, 8.5×11 inch (21.6×28 cm) paper ideal for solving on. 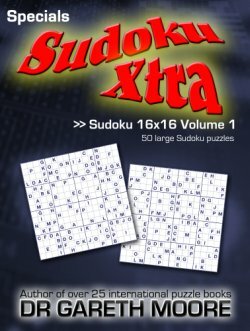 Sudoku Xtra 19, available now. Sudoku Xtra issue 15 is now available for download from SudokuXtra.com, and it’s another packed issue of the logic puzzle magazine. 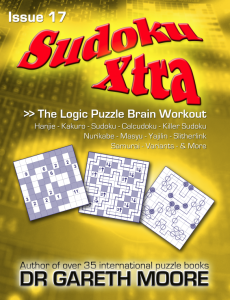 With 59 different types of logic puzzle at a wide range of difficulties it’s got something in it for everyone, and it’s far from just Sudoku and variants. 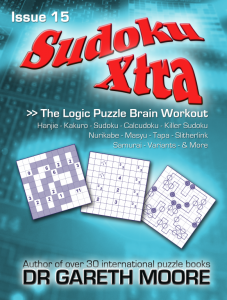 In fact there’s not a single regular 9×9 Sudoku in the whole magazine! From the giant cover Masyu through to the Tapa, Heyawake, Nurikabe, new puzzles and more there is plenty to keep you busy. The magazine can be downloaded as a PDF and printed at home, or it can be ordered pre-printed from Lulu or Amazon.com (the last of these coming in the next week or so, once their system updates and lists it). 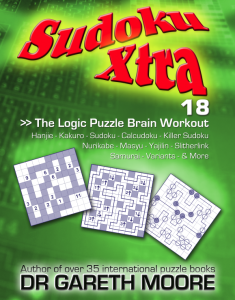 I’m also now posting full lists of content over on the magazines page at SudokuXtra.com,so you can click the expanding links to see a list of every puzzle in both this and the previous two issues, as well as order back issues. And talking of back issues, I didn’t post here previously but issues 13 and 14 are also available (and have been for 4 and 2 months respectively), although the Amazon.com issues of these have only just been uploaded so again these should appear in the next week or so. With 125 separate puzzles there really should be something in there for everyone, so whether you like huge Samurai Sudoku puzzles such as the 13-grid Samurai X, or just encountering a wide range of different Japanese logic puzzles, then there’s something in it for you. 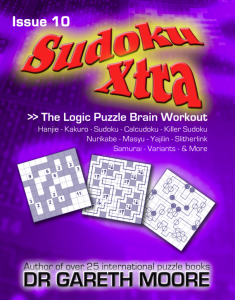 And don’t be confused by the name – the puzzles include not just Sudoku and a huge range of variants, but also Hanjie, Nurikabe, Yajilin, Slitherlink and many more. To celebrate the 10th issue I’ve featured a range of 10-themed puzzles in the main section, including some with 10-shaped givens, 10 sides, 10-related layouts or 10-based values in the puzzles (for example a powers of 10 +/- Killer Sudoku!). Meanwhile the Community Puzzles section just continues to get better and better thanks to the incredible skill and generosity of those contributing puzzles. 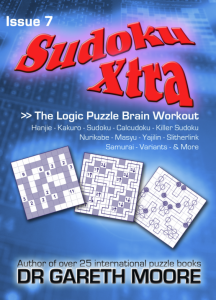 New this issue is a page of Labyrinth puzzles (as seen in Beyond Sudoku) from Nathan Roberts, as well as Navigrids plus a new puzzle from the Vexus Puzzle Design stall. There’s also a page of challenging Battleships puzzles courtesy of Clarity Media, and on top of that there’s an awesome loop puzzle called Castle Wall from Palmer Mebane/MellowMelon. The incredibly talented David Millar has crafted some special issue 10 puzzles, with some Sum Sudoku that have only “10″ clues, and a Slitherlink with only “10″ pairs in the grid! Meanwhile Grant Fikes has created three brilliant classic Nikoli-style puzzles, and there’s another visually-stunning Altair Slitherlink and more from Jim Bumgardner. Not only that but also Tom Collyer has created two more incredibly impressive Nurikabe-Sudoku cross-over puzzles, which really put all your puzzle-solving skills to the test. All that, and I’ve not even listed everything that’s to be found in the Community Puzzles section.